Members of the Senate's administrative committee have given Senator Mike Duffy two options: either pay back what they believe is $16,955 in ineligible expenses or opt for arbitration. The steering committee of the Senate's committee on internal economy, budgets and administration delivered a letter to the Prince Edward Island senator Friday explaining that it does not accept his argument that he should not have to repay the expenses because he was cleared of 31 criminal charges related to his Senate expenses in April. In June, Nicole Proulx, the clerk of the committee, told Duffy "new information surfaced in the public domain" warranting an assessment of the senator's expenses. 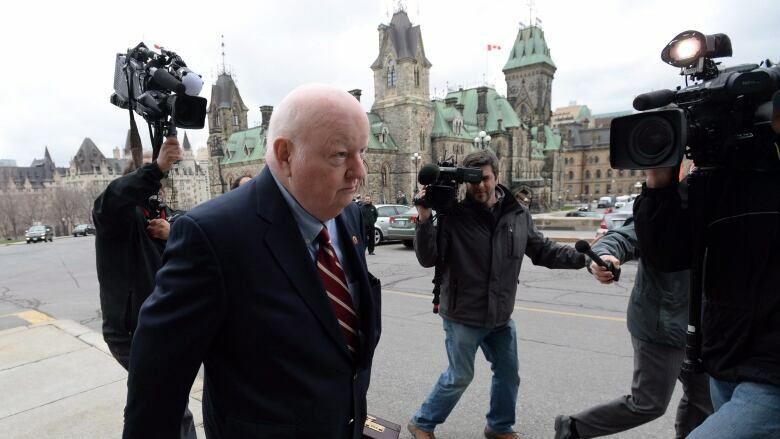 The committee flagged thousands of dollars of problematic expenses between the period of March 5, 2009 and Sept. 13, 2012, including charges for personal photos, makeup and Duffy's personal trainer. That prompted a public response letter from Donald Bayne, Duffy's lawyer. Bayne reminded the committee that Justice Charles Vaillancourt reviewed the claims the Senate is now raising and still cleared Duffy. He also argued that Duffy remained suspended without pay by the Senate until August 2015, suffering a net loss of more than $155,000. In an email to CBC News on Friday, Bayne called the committee's actions "unreasonable, unjust and an improper collateral attack on a final judicial decision and factual findings by a court," while noting that the demand for repayment came from the three senators on the steering committee and not the full internal economy committee. Friday's letter explains that Duffy now has 15 days to reimburse the money or seek arbitration from former Supreme Court justice Ian Binnie. The letter warns that if Duffy doesn't act, the money will automatically be deducted from his pay cheque. "This is an administrative matter between Senator Duffy and Senate Finance. As such, the Senate is adhering to the independent dispute resolution process that was implemented in May 2015 in exactly the same manner it has with every other senator," said a statement released by Senators Leo Housakos and Jane Cordy, the steering committee's chair and deputy chair. "Senate Finance has reviewed the documentation submitted by Senator Duffy's legal counsel and has determined there is no mitigating information contained within," the two senators said in the statement. Duffy became one of the faces of the Senate expenses scandal in 2014 after he was charged with offences linked to his living and travel claims. He returned to the Upper Chamber after he was cleared earlier this year.